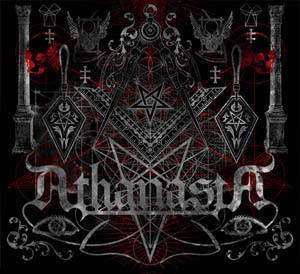 ATHANASIA Stream Track "Cyclops Lord (My Will Is Done)"
Los Angeles-based trio ATHANASIA blend classic thrash, power and black metal influences with modern heavy metal fury to create a sound that is equal parts commanding, aggressive, and melodic. The band is set to release their upcoming full-length album, The Order Of The Silver Compass, later this year. In the meantime, ATHANASIA is gracing fans with the unforgettable new track "Cyclops Lord (My Will Is Done)". Listen now below. Frontman Caleb Bingham says,""Cyclops Lord" is our take on the root of all evil... the almighty dollar! The song's strong lyrical content made this video beg for hidden subliminal visuals, not unlike those present on the dollar itself..."
Beginning as an extreme metal passion project of singer/guitarist Caleb Bingham (then called ASCENSION), ATHANASIA was originally put on hold for several years due to Bingham being invited to perform in notable groups such as the then-newly formed FIVE FINGER DEATH PUNCH, and Sweden-based melodic death metal group ZONARIA between 2005 and 2014. After sustaining a leg injury, Bingham ceased performing with ZONARIA and began putting his time back into the original project he worked so hard to create. Joined by bassist Brandon Miller and veteran drummer Jason West (MURDERDOLLS, WEDNESDAY 13, SEBASTIAN BACH), ATHANASIA is finally ready for its time under the spotlight. The Order Of The Silver Compass was produced/engineered by Caleb Bingham at Nightmare Sound, mixed by Chris Collier at CMC 21 Productions (KORN, LYNCH MOB) and mastered by Joe Bozzi (MASTODON, LA GUNS) at Bernie Grundman Mastering. Stay tuned for more coming soon from ATHANASIA leading up to the release of The Order Of The Silver Compass. "The Order Of The Silver Compass"
"Cyclops Lord (My Will is Done)"